Photographers are always looking for perfect light. Unfortunately, the quality of available light, and the situations in which photos are created, are rarely perfect. This is especially true when photographing weddings or portraits on location. So while finding beautiful existing light is every photographer’s ideal, it isn’t always possible. This is the point at which photographers tend to reach for a portable, on-camera flash. Indeed, these intense light sources can prove invaluable, but only if you know how to use them effectively. In the hands of an inexperienced photographer, on-camera flash will produce images that look flat and lifelessimages with harsh shadows, washed-out skin tones, cavernous black backgrounds, and other unappealing visual characteristics. 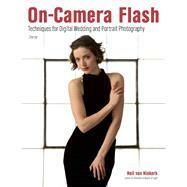 In this book, acclaimed wedding and portrait photographer Neil van Niekerk shows you how to avoid the pitfalls photographers new to speedlights often encounter so that you can produce professional images using on-camera flash. You’l learn to use simple accessories to manipulate the quality of light from your flash and how to improve a lighting scenario by enhancing rather than overwhelming the existing light. When the available light is too low and too uneven to be combined with flash, he shows you how to override it completely. Neil van Niekerk is a photographer based in New Jersey, with a diverse range, but specializing in weddings and portraits. Neil has presented workshops on lighting in the USA, the UK and Ireland, as well as The Netherlands. He has written 3 books with Amherst Media on flash photography and lighting techniques, with more in the works. He also maintains a website for photographers, Tangents (neilvn.com/tangents/), which is loaded with numerous tutorials on photography and photographic lighting.